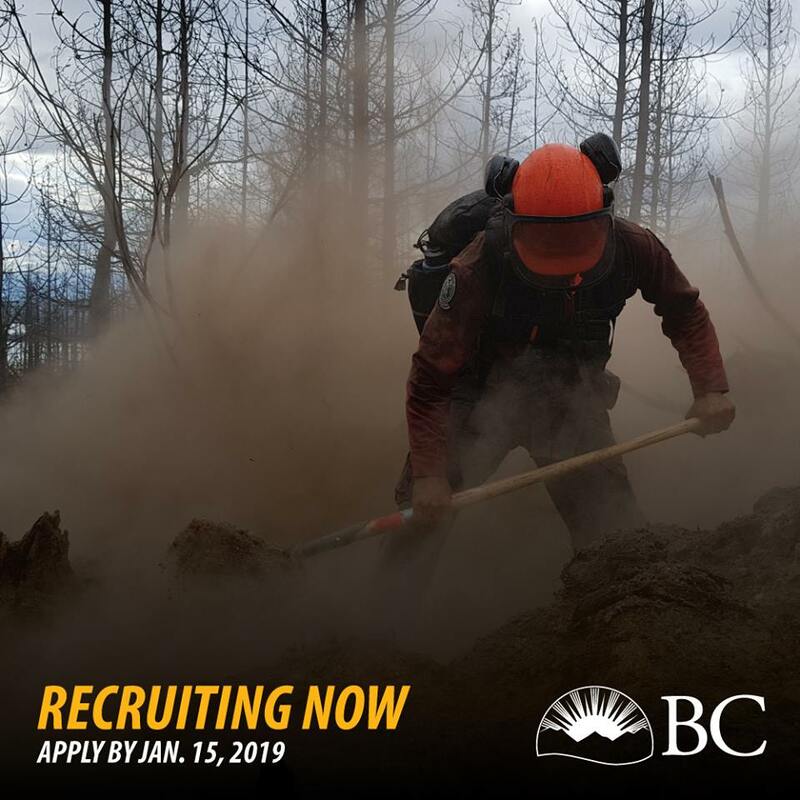 The BC Wildfire Service is accepting applications for wildland firefighter positions for the 2019 fire season. Online applications can be submitted on the BC Wildfire Service website until Jan. 15, 2019. The BC Wildfire Service is looking for new recruits to fill positions throughout the province, including in Williams Lake, Quesnel, 100 Mile House and Alexis Creek. Provincially, between 150 and 200 positions will be available. Applicants who pass the screening phase will be invited to attend an interview and complete a fitness assessment. These steps will be completed in February in various locations throughout the province. In Williams Lake, interviews will be held the week of Feb. 19, 2019. After new recruits successfully complete their first fire season, they are eligible for recall rights and will have a job with a four- to eight-month term. If work is available, this could lead to a year-round job with the BC Wildfire Service, allowing people to pursue firefighting as a career. Firefighting is a unique job. It’s a great opportunity for people who are interested in challenging themselves mentally and physically, seeing some of the most spectacular locations in the province, and working with a group of dedicated people who are passionate about what they do. During the winter, firefighters are able to spend time pursuing other activities, such as attending school or travelling. People who are interested in applying can also contact Eric Kopetski at the Cariboo Fire Centre for more information. Want to become a firefighter with BC Wildfire Service? Note, this type of article will be available exclusively to subscribers starting in January, 2019. Join us in December and receive the Trial Rate for a full year.